I mean Sales Invoices. When a customer pays the balance of their monthly statement it usually pays several invoices. 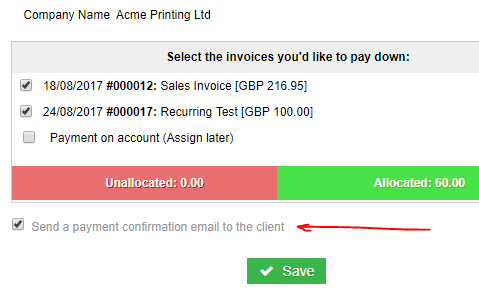 When payment is added by selecting all the invoices due there is no tick box to send an email? Could you get one of the tech team to pop in a tick box? Is there a way of sending a remittance advice for multiple payments ? i.e. If I’m paying ABC Limited today six different invoices I would like to send them one remittance advice email for all six payments. @vikstar I’ve moved your post here as there’s currently no feature to send a single email with multiple payment notifications. This is a “feature request” post so we will track interest in this going forward. ok thanks Glenn, have a great weekend. I would also find it very useful to send remittance with multiple invoices paid automatically. We have just added an option to the bank tagging section for assigning client payments to multiple invoices. It is now possible for an email confirmation to be sent when have multiple assignments like this. In order to get this working we introduced a new token to the email template @PaidInvoiceList@. We had to come up with a new default email format so it would work for single and multi invoice scenarios. The new template will look something like this. You can adopt this new template in the “Routine Emails” section by selecting the option to revert the template to default. For more information on multiple invoice payment confirmation please see here. Please note: This feature is only available for client payment notifications. Supplier remittance notices are not currently supported. @Glenn, that looks fantastic and will certainly improve functionality. Are you able to add a similar function for payment of purchase invoices/supplier invoices? @LC_Hydraulics excellent, good to hear! We will look at supplier invoices too, the only slight issue there is listing invoice numbers that the supplier would be able to linkup to their own records. The supplier invoice is usually entered into the “Supplier Ref” field on the purchase invoice but is non-mandatory. I suppose we could just include it in the list item if it was present or otherwise just list the date and amount? @LC_Hydraulics just a quick one to let you know that we are also now supporting remittances for multiple purchase invoices. We used the format in my previous post and it works much like it does with client payments. Just remember to make sure the remittance email template has the @PaidInvoiceList@ token. If you’ve made any custom edits to this you can easily revert back to the new default. This is brilliant - much more intuitive that the previous way of sending remittance advice.